Locks Heath celebrated a highly-successful Swim Out Of Your Skins meet in Waterlooville, winning seven gold medals. In total, 94 personal bests were achieved, with 10 silver and 13 bronze medals, to go with the gold medal tally. Thomas Larby was one of two swimmers to win double gold. The 11-year-old was victorious in the 50m butterfly and 200m individual medley. 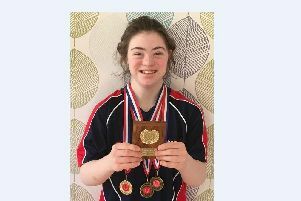 Double success was also achieved by Amelia Ayling, as she won gold in both of her freestyle events. Evelyn Hall also won two medals at the meet. She grabbed gold in the 50m freestyle and followed that up with a bronze in the 200m backstroke. Shannon Lamb, 12, won the most individual medals on the day. She took gold in the 50m backstroke before finishing in the top three of the 200m freestyle, butterfly and individual medley. The final gold medal went to Grace Goddard in the 50m breaststroke. Joshua Beaudro won three medals – in the freestyle, backstroke and breaststroke. Mary Edwards also stepped on to the podium after superb displays in the breaststroke and butterfly events. Nine-year-old Finlay Norris secured his first-ever medals – a proud moment for the swimmer, his parents and coach. Meanwhile, May Fletcher, Matilda Hall, Kyle Kirkland and James Hall were fellow double medalists. Juliet Jarvie, Ella Richardson-Fitt, Taylor Gargiulo and Harrison Kennedy all won a medal each. There was also a proud moment for Josh Henderson, as he competed in his first ever meet.